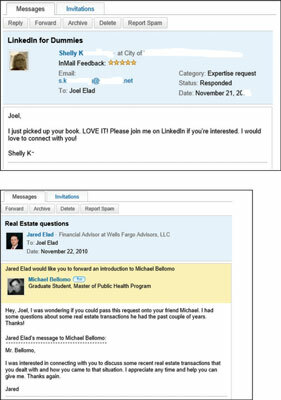 What is the Difference between LinkedIn InMail and Introductions? Your first question when you start using LinkedIn is most likely, “What’s the difference between introductions and InMail?” The answer depends on how involved your common friend or colleague is in connecting you with this new contact. Every LinkedIn user decides on his own contact level, and a user can decline to allow any introduction or InMail to reach him, regardless of sender. If you don’t want to receive any introductions or InMail, simply deselect all the Contact Settings options. If you don’t mind introductions but really don’t want to have to deal with any InMail, just deselect the InMail option in the Contact Settings section and leave the Introductions option alone. Otherwise, leave the InMail option selected, since it is a valuable tool for sending and receiving communication with people who might become a valuable part of your network or help you with one of your professional goals. Say you’re at a party with your friend Michael, and you say to him, “You know, I’d really like to meet someone who can help me with some software tasks for my company.” Michael looks around, sees his friend James, and introduces you to James by saying, “Hello, James. This is my entrepreneur friend from business school, [Your Name Here]. [Your Name Here], this is my old buddy James. He and I studied computer science together in college.” After that, Michael might give some more background information about each person to the other. On LinkedIn, an introduction is very similar to this real-world example. You send a request to someone in your immediate first-degree network (Michael) and ask that person to introduce you to someone in his network (James) by forwarding your request. In some cases, if you’re trying to reach someone in your third-degree network, your introduction request would have to go to two different parties before reaching the intended recipient. You’re represented by someone close. Instead of sending a random, unexpected e-mail to a stranger, you’re introduced by somebody who knows the intended party, even if that introduction is done with an e-mail. That gives your introduction request a much higher chance of being read and getting a response. You get your network involved. When you ask people in your network to get involved, they learn more about you and your intentions, and sometimes you might find what you’re looking for is closer than you think. In addition, when you ask them to pass along your introduction request, you can offer to facilitate an introduction on their behalf, which helps both parties. You leverage the power of your network. By using LinkedIn, you not only expand your network by using your first-degree connections to help you meet new people, but you can also decide who would make the introduction for you. It’s a good idea to read up on your friend’s profile and your intended party’s profile to see what they have in common. You can have multiple introductions going on at one time. With a LinkedIn free account, you can have up to five open introductions going at any one time. When you get introduced to your intended party, that spot opens up, and you can make another introduction request. InMail, in all cases, costs money, either on a per-mail basis or as part of a premium paid account. You can get more introductions at one time by upgrading to a premium account. Because everyone on LinkedIn has a profile and a secure message Inbox, communicating with other people online is easy. LinkedIn allows you to send InMail directly to an intended party, regardless of whether he is directly or indirectly connected with you. The e-mail gets immediately delivered to the recipient’s web-based Inbox on the LinkedIn site (and, if the recipient has configured his settings to get e-mails of all his InMail, in the Inbox at his e-mail address); the sender never learns the recipient’s address, so each party has some privacy. The recipient can then read your profile and decide whether to respond. The cost of using InMail depends on whether you subscribe to a premium account. You can purchase InMail credits (one credit allows you to send one message) at a cost of $10 per InMail message. Premium accounts, such as the Job Seeker account for $29.99/month, come with a set number of InMail credits per month that roll over to the next month if unused. The Business account gets 3 credits per month, the Business Plus account gets 10 credits per month, and the Executive account gets 25 credits per month. Delivery is instant. With InMail, you simply write your message or request and send it directly to the intended party. There’s no delay as a request gets passed from person to person and waits for approval or forwarding. You owe no favors. Sometimes, you just want to reach somebody without asking your friends to vouch for you. InMail allows you to send a request to someone new without involving anyone else. It’s sure to be delivered. With introductions, the party(ies) involved in the middle could choose to deny your request and not pass along the message. With InMail, you know that the intended party will get a copy of your message in his e-mail account and LinkedIn Inbox.